LAKE WALES, Fla. – Six USCB baseball players put up impressive numbers in a wild Sun Conference All-Star Game on Saturday at Warner University. 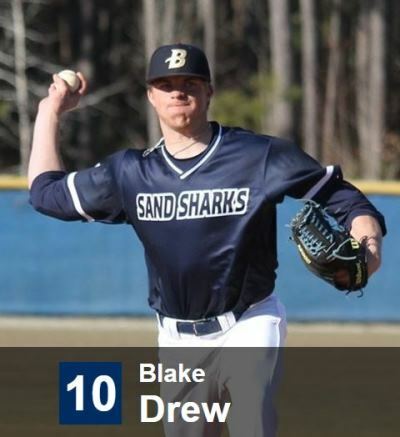 Four Sand Sharks contributed to the North squad’s remarkable rally from an 11-run deficit for a 20-16 win, while two USCB pitchers put up scoreless innings on a day when the bats clearly had the upper-hand. Most pitchers had a tough time, but USCB seniors Blake Drew and Jamie Strock each pitched scoreless frames. Drew issued a walk and hit two batters but registered two strikeouts to get out of the jam, while Strock struck out one and allowed a single in his inning of work. The Sand Sharks’ representatives helped the North team dig out from an 11-0 deficit. Junior first baseman Justin Kortessis went 2-for-3 with an RBI and scored twice, junior outfielder Thomas Estopare was 2-for-3 with a double, a walk, and an RBI, and junior third baseman Brandon Joyce went 1-for-3 with a walk and scored two runs. Junior catcher Nick Payne entered the game in the seventh inning and went 1-for-3. The Sand Sharks open the regular season Jan. 30 with a doubleheader at Trinity Baptist in Jacksonville, Fla. USCB’s home opener is scheduled for 1 p.m. on Feb. 12 with a Sun Conference matchup against Thomas.